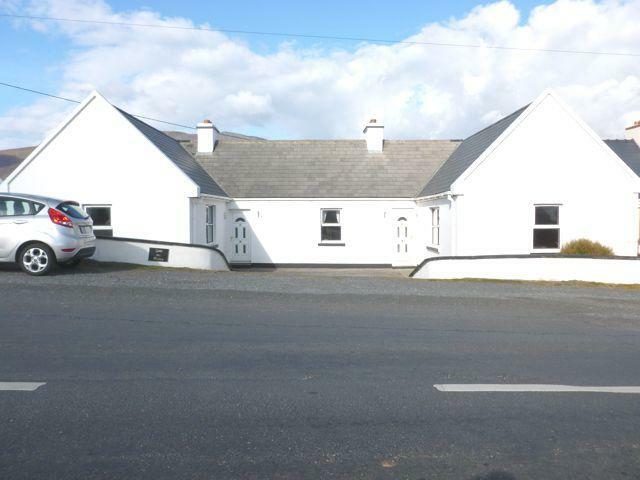 These modern cottages are situated in the picturesque village of Keel and command stunning views over Keel bay and the spectacular Minaun cliffs. The blue-flag beach is less than 200 metres away and is ideal for a variety of activities including surfing, hang-gliding and kiteboarding. Keel golf course is less than 500 metres away in addition to a stunning lake that boasts a variety of watersports. These semi detached houses are 2 bedroomed that sleep 4. 1 double room and 1 Twin Room. Bed linen provided. Beds are made upon arrival. Cots & Highchairs are available on request. Private car parking. From Shannon : Take N18 to Clarinbridge via Ennis, N6 to Galway, N84 to Ballyhean via Ballinrobe.N5 to Castlebar, N59 to Mulrany, R319 to Keel via Achill Sound. From Dublin: N4 to Edgeworthstown, at Longford bypass roundabout take 2nd exit into bypass. N5 to Castlebar, N59 to Mulrany, R319 to Keel via Achill Sound. In Keel, the houses are located on the right hand side of the road, approximately 100 metres past the local village shop.